FOR the second time in a fortnight the Voice visited the beautiful Himalayas, this time with local resident Alice King. 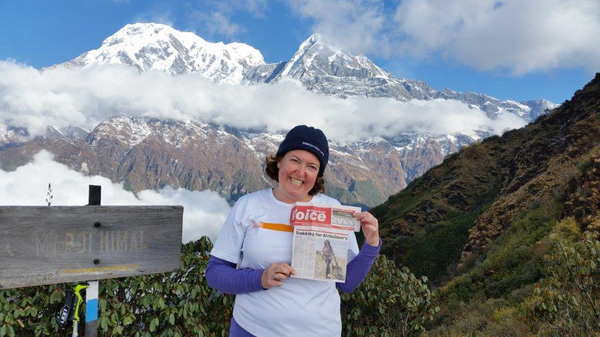 Alice took with her the front page of the Voice and an article in that edition about her training for the trip in September. “Due to strict weight restrictions on our gear, I couldn’t take the whole paper with me!” she told the Voice. Alice took the trek for two reasons: to make her 50th year her best yet and to raise money for Alzheimer’s research. So far she’s raised $3,524, smashing her previous goal of $2,000. Alice’s 82-year-old father, Francis, was diagnosed with the disease 10 years ago. “The most distressing thing for the family is the person losing bits of who they are,” Alice told the Voice in September, as she trained for the monumental trek.